Australia's summer of batting near misses and bouts of pain continued, but they won't be too bothered after staying well ahead of West Indies on the opening day of the final Test. While Ricky Ponting was forced to retire hurt with a throbbing left elbow and Simon Katich and Shane Watson left agonisingly close to deserved centuries, the hosts quickly forgot about their below-par performance in Adelaide and were on track for a series win after posting a formidable 3 for 339. Ponting's elbow was the greatest concern for the hosts after he walked off on 23, but he was cleared by x-rays and will bat when required. The damage for West Indies, who could not provide lasting support for Kemar Roach, could stay a bit longer on a pitch that looked fun for batting - except when Roach was operating. Roach woke the tourists from their morning slumber during a five-over burst from the Lillee-Marsh End in the middle session, forcing Ponting's retirement and removing Watson for 89. Strangely, he was not given the ball again until the second new ball was taken and was allowed an over into the wind before being replaced. He walked off with 1 for 67 in 13 overs, figures which don't reveal the damage he caused. In between Roach's spells the spinners strangled Katich and Michael Clarke, giving some justification to the strange method of employing them both straight after tea. 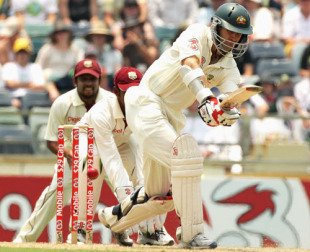 Katich was the most unfortunate, finding square leg with his sweep of Sulieman Benn to register his second 99 in Tests. He left without emotion but it was a wasted opportunity that maintained Australia's record of not owning a century in the three-match series. At least Watson didn't briefly lose his mind, with Roach's sharp ball going away and brushing his edge on 89, but it didn't ease the pain of missing a maiden hundred, just as he did after reaching 96 in Adelaide last week. The day began with a 132-run stand between Watson and Katich, a partnership which was so comfortable it seemed like they would be unhappy if they didn't reach 600. By stumps, on a pitch missing the traditional steepling bounce, Hussey had taken them to comfort with a bright 81. Simon Katich fell on 99 for the second time in his Test career, joining seven other batsmen who've suffered this fate. The only other Australian in the group is Greg Blewett. Australia lead quite comfortably in terms of batsmen who've been dismissed for 99 - it's happened to them 22 times, nine more than England, who are in second place. Michael Hussey's half-century is the 13th for Australia in this series, but no batsman has managed a hundred yet. West Indies have seven 50-plus scores, of which three have been converted into hundreds. In seven innings, Katich and Shane Watson have added 644 runs for the first wicket at an average of 71.55, with two century stands. Ponting headed for hospital shortly before tea after being shaken by the spell of Roach, who had picked up the captain twice in the series. Life was immediately uncomfortable for Ponting, who ducked and turned his head in response to a 146kph short ball that arrived as his second delivery. His arm remained high to take the impact and following a delay for treatment he was breathing deeply again when hit in the stomach jumping back to Roach. Ponting is now 34 and was noticeably slow at the start, although Roach had some inspiration after the captain said in the lead-up to the match that the extra speed did not worry him. The injury continued to bother Ponting for the next 36 minutes and he managed to ignore the pain briefly to pull Roach for six, not worrying about the two men on the boundary. However, he was grimacing again following a pull off Dwayne Bravo and went off to give Hussey a chance to secure his spot. On his home ground, Hussey produced his most authoritative innings of the series, pulling powerfully on occasions and working the ball cleverly. His innings peaked with three fours in Roach's opening over with the second new ball and he will be desperate to reach three figures on the second morning when he resumes with Marcus North (23). Katich held everything together during his considered display, giving the strike to Watson as the allrounder entertained with pulls, cuts and crisp drives during his 15 boundaries. After surviving a drop from Chris Gayle at first slip on 7, Watson moved freely throughout and a pull and an on-drive took him to 89, but he slipped against Roach and walked off without a lengthy bat raise. For most of the morning Katich was content to complement Watson and had scored 4 by the time his partner was 27. He was the ideal support for Watson and then Ponting, attempting to help his leader through the discomfort. There were brief bursts, with a couple of boundaries in overs from Bravo and Gavin Tonge, but he lost focus at the wrong moment. Clarke followed with a rash shot on 11 to hand Narsingh Deonarine a reward for his casual offspin. Deonarine and Travis Dowlin had come in for the injured Shivnarine Chanderpaul and Adrian Barath, leaving West Indies to hope for a small first-innings target in their push to level the series. Tonge was called in for his debut, replacing Darren Sammy, and he found it difficult to offer Roach any long-term help. Tonge went for five an over and Ravi Rampaul and Bravo created few moments of fear for the hosts. The spinners combined for 37 overs and reduced the run-rate after tea, but the visitors will have to create more chances, rather than waiting for things to happen, if they are to challenge over the final four days. At the moment Roach is the only real danger to Ponting and his men. As the captain re-discovered, his threat is serious.